Indian tribes, or nations, are not part of the US federal or state government systems, but have a separate, government-to-government relationship with the federal government. Tribes adopt constitutions, pass civil laws to regulate conduct and commerce on their lands and enforce these laws with their own judicial systems. However, there are limits to tribal authority and legal authorities have referred to tribes as semi-sovereign, “domestic dependent nations.” For example, with regards to law enforcement, three factors determine whether the tribe has legal jurisdiction when a crime has been committed: 1) Where the crime was committed: Even when Native Americans are involved, only crimes committed in Indian Country are under tribal jurisdiction; 2) Who committed the crime: Tribes only have jurisdiction over American Indians; non-Indians are not subject to tribal jurisdiction. States have jurisdiction to prosecute offenses by non-Indians even in Indian Country and; 3) What crime was committed: Most serious crimes committed in Indian Country are under federal jurisdiction. In addition, tribal courts cannot impose convictions greater than imprisonment for a term of one year or a fine of $5,000. The Major Crimes Act of 1885 provides for federal criminal jurisdiction over seven major crimes when committed by Indians in Indian country, over time other offenses have been added and the number now stands at 16 offenses. 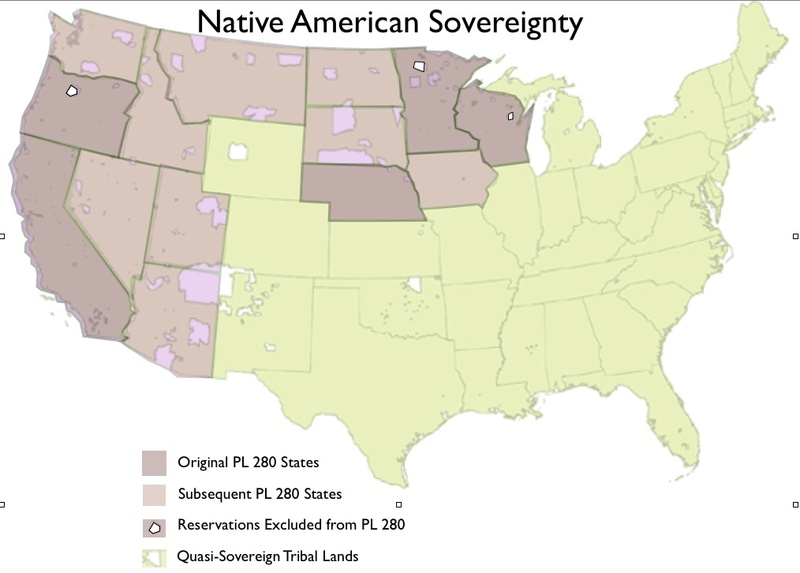 In order to address the issue off lawlessness in Indian Country, Public Law 280 (1953) granted civil and criminal jurisdiction of Indian Country to certain state authorities including; Alaska, California, Minnesota, Nebraska, Oregon, and Wisconsin. The states that assume full or partial jurisdiction are Arizona, Florida, Idaho, Iowa, Montana, Nevada, North Dakota, South Dakota, Utah, and Washington. Unfortunately, PL 280 has had an adverse effect in Indian Country by creating a sense of lawlessness because of confusion concerning jurisdiction. Many criminal cases that occur in Indian Country are never tried. Consequently, many Native Americans feel that Public Law 280 created animosity between state and local authorities. In addition, according to one study, State or county police serving Public Law 280 reservations are rated by Public Law 280 reservation residents as less available, slower in response time, less prone to equally attend to minor or serious calls, provide less beneficial patrolling services, less willing to act without authority, more frequently decline services owing to remoteness, and are located farther away than federal-BIA and tribal police on non-Public Law 280 reservations. The Tribal Law and Order Act (TLOA) (2010) was designed to help improve the state of law enforcement in Indian Country created by PL 280 (1953). This piece of legislation is unique because the Department of Justice (DOJ) and the Department of the Interior (DOI) met in collaboration with tribal leaders and tribal justice professionals in order to come up with a long-term plan to improve law enforcement in Indian Country. This collaborative effort has given the tribes of Indian Country a voice regarding legislation concerning Indian Country. In addition, parts of the TLOA emphasize the importance of collaboration between state and local authorities. Recommendations that emerged from a study conducted in 2007 support the need for the proposed PL280 Policing Partnerships program. The recommendations include the need to enhance communication and cultural understanding between state/county law enforcement agencies and courts with tribal communities; increase accountability of state/county law enforcement and criminal justice to tribal; provide incentives and support for the development of tribal-state cooperative law enforcement agreements; and more community-based policing and police responsiveness to the most serious and frequently occurring crimes in Public Law 280 and non-Public Law 280 jurisdictions. SAI will leverage its vast experience in facilitating strategy and action planning summits to address crime, drugs, and other social issues in partnership with law enforcement and key stakeholders, together with our experience in working with tribal law enforcement, to strengthen the relationship between tribal law enforcement, non-tribal law enforcement, and US States Attorneys in Public Law 280 sites. The program will include a two-day site specific Community Oriented Policing Training augmented with cultural dialogue training and action planning. Participants will include Sheriffs, Chiefs of Police, US Attorneys, and Tribal Leaders. The program goal is to improve public safety on tribal lands by developing a training program that builds the knowledge, skills and abilities of tribal law enforcement agencies to build more effective relationships with non-tribal law enforcement to advance community policing. Specific objectives include: 1) designing a web-based training curriculum tailored to Public Law 280 communities to enhance tribal and non-tribal law enforcement cooperation and, 2) ensuring tribal and non-tribal law enforcement agencies access the curriculum.